A therapist and wilderness guide, Bill Plotkin has developed a new approach to nature-based spirituality which combines modern psychology, ceremony, and wilderness experiences, to support people in uncovering their deepest personal truths. Soulcraft is an approach to the psyche and the world that embraces both wild nature and the depths of our souls; it could be called an eco-depth psychology. Written for people in search of their true selves and for those at a crossroad or transition in their lives, Soulcraft outlines a journey, drawn on ancient traditions, that takes the form of a ceremonial “descent to soul,” uncovering and retrieving the passion and wisdom of the heart. The descent can also reveal the unique gift that each individual can bring to the world. 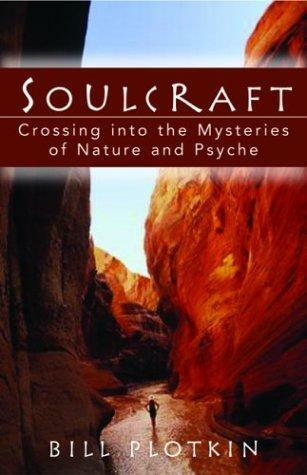 To accelerate the descent, he offers “practices for ‘leaving home’—loosening your attachment to your current personality and the worldview within which you have operated.” Soulcraft explores over 20 pathways to soul encounter, specific methods for discovering and investigating soul’s dark mysteries. Although they spring from the traditional waters of nature-based cultures, these pathways are presented here in contemporary Western containers. The methods range from soul-oriented dreamwork to trance rhythms and dance, and include self-designed ceremonies, soul poetry, the way of council, the modern vision quest, and communicating with nature through signs and omens as well as through direct dialogue. For millennia, ceremonies and initiation rites have helped societies survive and thrive by marking life transitions. In contemporary America, except for bar mitzvahs, graduations, and weddings, these rituals are conspicuous by their absence. Written for people in search of their true selves--particularly those on the verge of adulthood and those at a major crossroads such as divorce or carrier change--"Soulcraft restores the ritual to its rightful place as a crucial part of personal growth and self-employment. Exercises and insightful stories explain how to discover one’s unique gift, or "soul purpose," to be shared with others through a ceremonial event. Drawing on ancient traditions, this vision quest serves as a modern rite of initiation.